A Princeton University professor and author canceled lectures in Seattle and San Diego this week, saying she received death threats following a commencement address in which she called President Donald Trump "a racist and sexist megalomaniac." 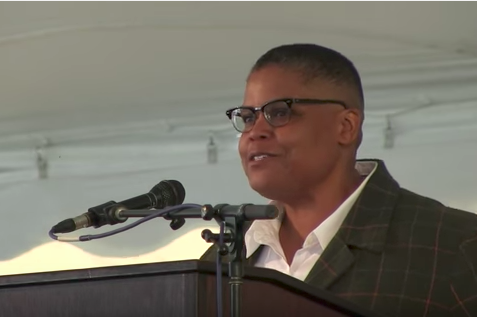 Keeanga-Yamahtta Taylor, an assistant professor of African American Studies, was set to speak at Seattle's Town Hall Wednesday about her new book, "From #BlackLivesMatter to Black Liberation," which looks at the development of the Black Lives Matter movement and its context in the present political landscape. She spoke to graduates at Hampshire College in Amherst, Mass., on May 20. In a statement posted Wednesday to her publisher's Facebook page, Taylor said she has since received more than threatening emails, including some that made references to killing her. She blamed a Fox News segment on her speech that aired on "Fox & Friends Weekend" a week later. The story included a video clip showing excerpts of Taylor's speech that included her statement on Trump and her warning the graduates about the world they were graduating into, she said Wednesday. "The threat of violence, whether it is implied or acted on, is intended to intimidate and to silence," she wrote. "But I am releasing this statement to say that I will not be silent." A Seattle Times report included a "Fox & Friends" statement in response to Taylor's comments. "We played Ms. Taylor's comments as they were and did not editorialize her commencement address," executive producer Gavin Hadden said. "We frequently cover commencement addresses around this time." Taylor, on sabbatical from Princeton for the year, was also set to speak this week at the University of California-San Diego.